It’s time to get your marketing wheels turning because one of the most significant events in the affiliate world is landing in Singapore this October! 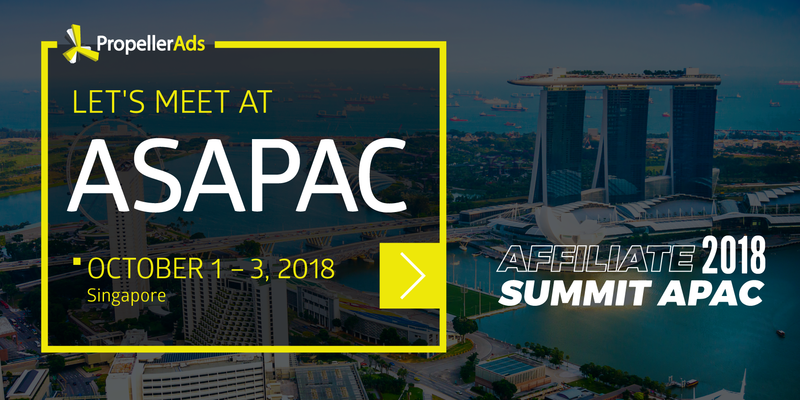 Affiliate Summit APAC 2018 will bring together business titans, international marketing experts, and best industry minds to share their insights on how affiliate marketing is going to develop in 2019. Mark your calendar as busy on October 1-3, 2018. APAC is an excellent opportunity to network! Where else can you meet top affiliates and discuss future promos in person? PropellerAds Team will obviously be there: we are presenting our latest products and research to help affiliates succeed. Why meet us in Singapore? So how can stopping by our Meet Market table literally save you thousands of dollars? 1. Serious scientific research. We share our knowledge with affiliates, so they don’t have to go blindfolded through wild marketing woods. We know the path! Native ads simply because this trend is taking center stage. The formula is straightforward: less intrusive ads, but more focused on what users really want to see. Align your ads with your goals! Push Notifications. Affiliates’ favorite ad format. Why? It ensures direct contact with customers and lightning-fast communication. New retargeting for Popunder. Well-known format but with a modern twist. Learn how to make it work at our Meet Market table. 3. Tips from people who have been in your shoes. Lots of our team members are very experienced in affiliate marketing. They know the market, they understand the product, and they have answers to your questions. Do you like things to be carefully planned? No problem! Book a meeting with our team by clicking the button below. See you at ASAPAC!